Our Steel Decking is manufactured by a Steel Deck Institute (SDI) Certified Member. Decking comes in various Sizes, Profiles, Material Gauges, Loading Capabilities and can be used for: Mezzanine Floors, Ceilings, Canopies, Shelving and can also have concrete poured over it. Most of the Decking is produced from G60 or 090 Bare Galvanized material. Securing the Panels to the sub-structure can be done by either welding with weld-washers or using special fasteners made to penetrate into the thick steel below. Accessories such as Rubber Closures, Fasteners and Pour Stop Angles are also available. All Panels can be Prime Painted, both sides or just (I) side, either White or Gray at an additional cost. This will allow you to field paint any color desired. 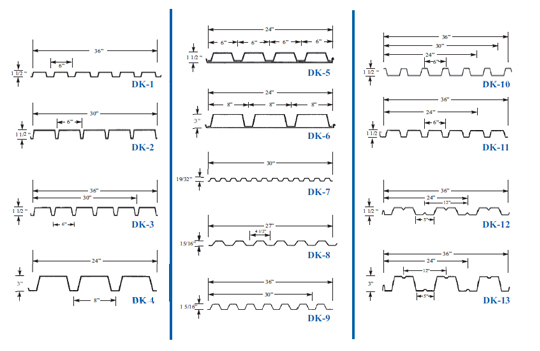 Panels - DK-I, DK-4, DK-5 & DK-6 are also available in Acoustical. Panels - DK-5 & DK-6 are made as a "Cellular" Roof Deck Panel with a flat metal inner liner and a ribbed profile on the outer layer. Panels - DK-I I, DK-12 & DK-13 can also be made into a "Cellular" Deck Panel.